THE SMARTEST MONKEYS IN THE WESTERN HEMISPHERE ARE THE CAPUCHINS - BUT THE SMARTEST OF THE SMART, A SINGLE TROUPE, ARE CALLED "EINSTEIN" MONKEYS. ONLY IN PARNAIBA HEADWATERS NATIONAL PARK, BRAZIL PHOTO: ©GERRIE RALL, COURTESY OF SOUTHWILD WOLF CAMPS. The Rain Forest's Amazing Neighbor: The Cerrado! Ever wish you could look through the wall and peek into your neighbor's world? You know, that quiet neighbor, the one no one ever sees. What if you did? What if you discovered a place filled with rare and unique animals - more than 1,600 in fact? Unusual mammals, flashy birds, and scarce reptiles all living in that quiet next door – a place of mountains, and grasslands, and rivers, and waterfalls, as exceptional and threatened as the animals themselves. Would you visit that world? Meet the Amazon rain forest's silent embattled neighbor: the wild Cerrado - and seven of its amazing animals! Brazil's Cerrado: This is Truly a Road Less Traveled! 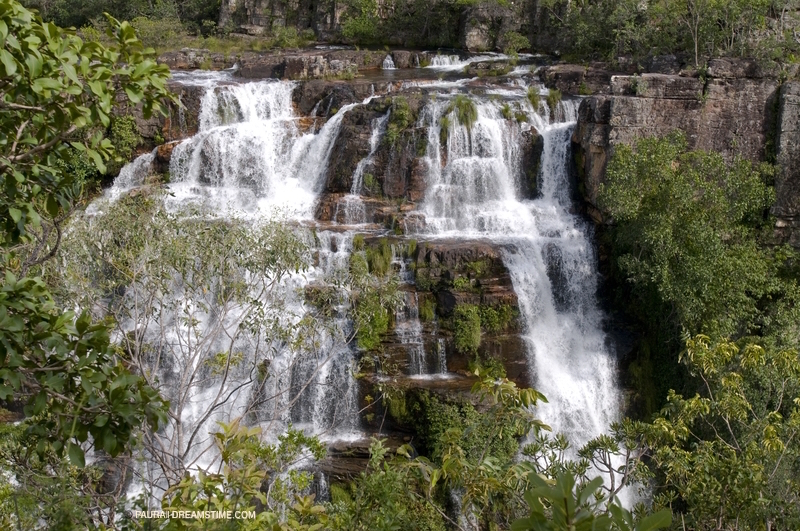 Brazil’s Cerrado has only three protected national parks: Chapada Dos Veadeiros National Park (the most widely known and visited) and Emas National Park, designated together as a UNESCO World Heritage site, and the little known Parnaiba Headwaters National Park. Emas and Parnaiba are virtually tourist deserts - the perfect road-less-traveled destinations. The wildlife will be most prevalent in these two parks, and having a field guide to help you is the best way to experience it. Only Parnaiba has accommodations inside the park. THIS MANED WOLF IS A NIGHT VISITOR TO THE WOLF CAMPS AT PARQUE NACIONAL DE CHAPADA DOS VEADEIROS ( PARNAIBA HEADWATERS NATIONAL PARK) BRAZIL. IMAGE: ©PAUL KLOCKENBRINK THANKS TO SOUTHWILD WOLF CAMPS. 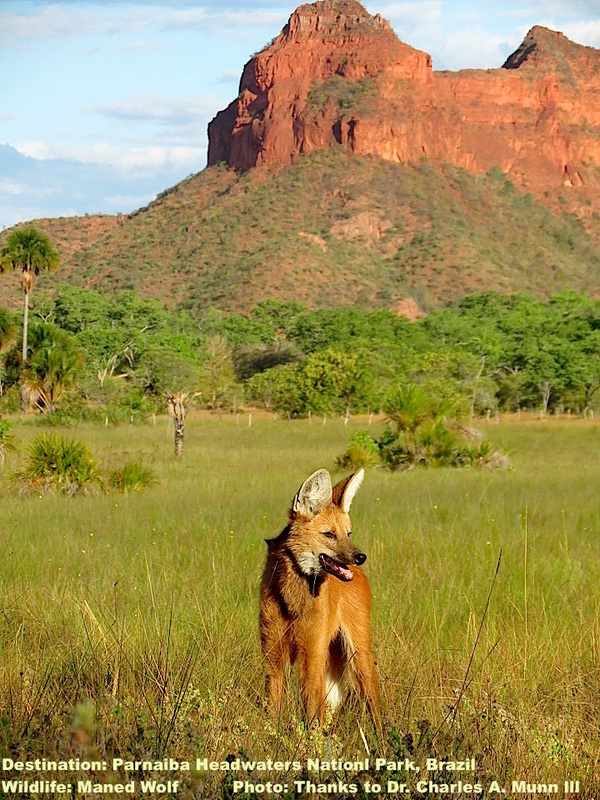 MANED WOLVES ARE BUILT TALL TO LOOK OVER CERRADO'S GRASSLANDS. PHOTO: THANKS TO ©DR. CHARLES A. MUNN III & SOUTHWILD WOLF CAMPS. Talk about identity confusion! This beautiful “wolf” may be the largest canid in South American, but they do not howl, form packs, or hunger after large prey. Instead, their slender red-haired bodies seem to glide, lifted above the Cerrado’s tall grass on surprisingly long legs. They are looking for mice or other small mammals but love best the wild lobiera fruit (similar to a tomato). Listen, you may hear their unique roar-bark, some Brazilians say you can predict the weather by it. Maned wolves get their name from the shock of dark hair extending from the top their heads to their shoulders; it stands on end looking like a mane when they get spooked, which is fairly often for this shy creature. However, their nickname, Fox-On-Stilts, is a far more apt description. Although their traditional range runs through the South American grasslands in Paraguay, northern Argentina, Bolivia, Peru, and Brazil, the largest remaining populations and the best possibility to see these shy creatures are in Brazil's Cerrado. Best viewing opportunity: Parnaiba Headwaters National Park at the Wolf Camp, also found at Emas National Park. Only a Single Troupe in the World are called "Einstein"
"EINSTEIN" MONEKEYS HAVE BEEN DOCUMENTED USING TOOLS CONSISTANTLY. THEY ARE ONLY IN PARQUE NACIONAL DAS RIO PARNAIBA (PARNAIBA HEADWATERS NP) IN BRAZIL'S CERRADO. IMAGE: THANKS TO ©DR. CHARLES A. MUNN III 7 SOUTHWILD WOLF CAMP. 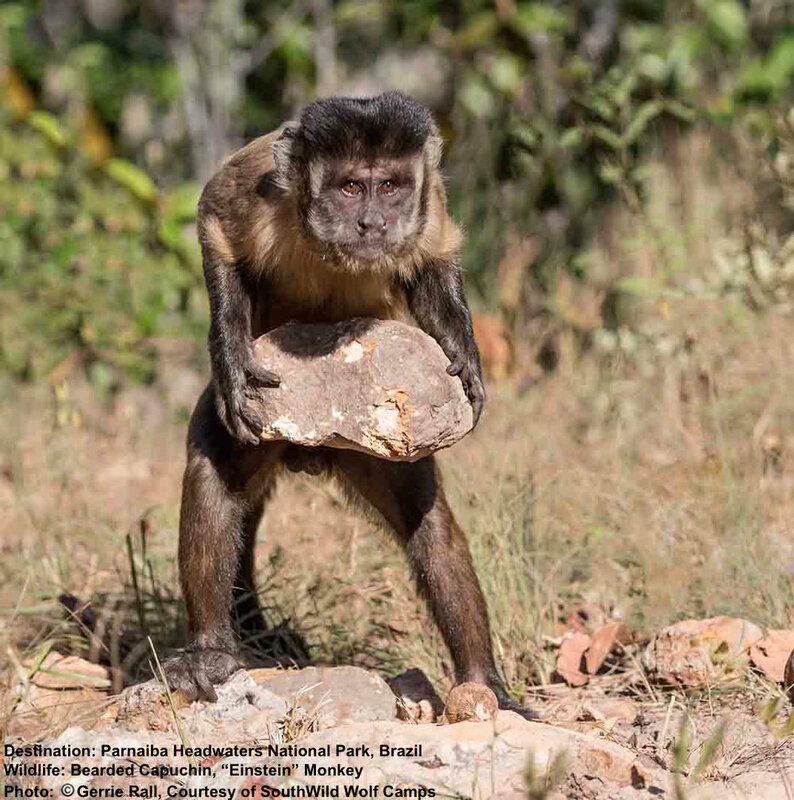 A CAPUCHIN USES A ROCK'S FLAT SIDE & A "SLIP-RESISTANT" ANVIL TO SUCCESSFULLY BREAK A NUT SHELL. IMAGE: THANKS TO ©DR. CHARLES A. MUNN III & SOUTHWILD WOLF CAMPS. The answer can only be the adorable Capuchin money, the smartest primate in the New World. But there is one particular troupe that is the brightest of the of the bright! Here, in one small corner of the Cerrado live a single troupe of Bearded Capuchins, so smart that primatologists have nicknamed them after a world-renowned physicist. These few "Einstein" monkeys reside together only in Parnaiba Headwaters National Park. The crafty Capuchins have gone beyond simply cracking nutshells for food; these are the first non-ape primates to be documented tool users. Moreover, they have a system! First, they examine and choose a nut, a rock “anvil,” and a “hammer.” Next, the nut is skillfully placed flat side down on the “anvil” to secure it from rolling away, then the monkey lifts the rock over its head and smashes it down, efficiently exposing the food. The Capuchins are methodical, consistent, and very successful. Their serious expressions are priceless! Guides from SouthWild Wolf Camp in PHNP will make sure you witness the action – responsibly. 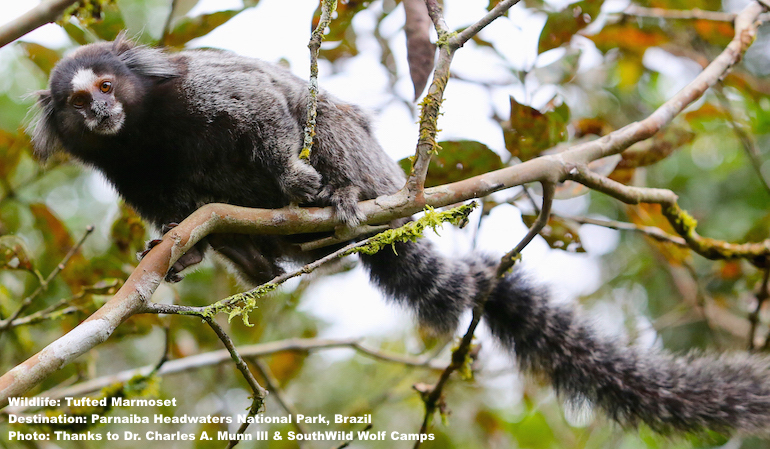 A CURIOUS TUFTED MARMOSET MONKEY WATCHED AS THE WATCHERS WATCHED HIM AT THE SOUTHWILD WOLF CAMPS, PARNAIBA HEADWATERS NATIONAL PARK. IMAGE THANKS TO: DR. CHARLES A. MUNN III AND SOUTHWILD WOLF CAMPS. THE HYACINTH MACAW MAY HAVE SOME HEALTH SECRETS TO SHARE. THEY DO NOT DEVELOP HEART DISEASE FROM THEIR SUPER SATURATED FAT DIET. IMAGE: THANKS TO CHARLES A. MUNN III & SOUTHWILD WOLF CAMPS. With a thick, massive beak built to open coconuts, covered in bright blue feathers, and at a size larger top-to-tail than all other parrots, this bird cannot hide. Although once numbered in flocks of 100’s of thousands poaching for meat, feathers, and a vigorous international exotic pet trade brought them to near extinction. Today, maybe 2,500 - 5,000 remain in the wild. 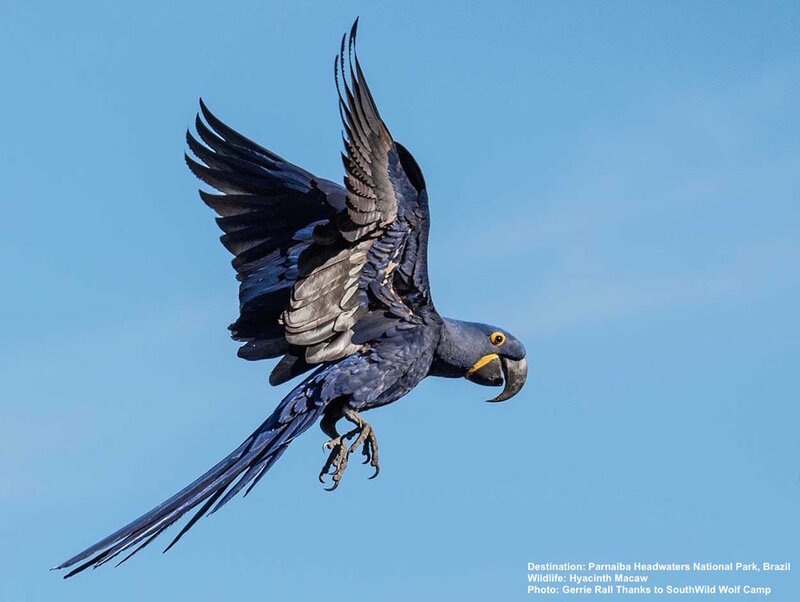 That we can still see the hyacinth macaws in the wild is in great part thanks to a concentrated conservation effort, including turning career hyacinth traffickers into protectors. Hooray for responsible tourism! Helpful to Human Health? We may be able to learn a thing or two about human heart-health from the big birds. The hyacinth macaw lives mainly on palm nuts, the acuri, bocaiuva, and even coconuts slicing through the thick shells with a slit that looks like it came from a metal cutting saw or laser. Somehow this diet, ultra-saturated in saturated fat, does not cause the birds to develop arteriosclerosis! Best place to see them: Watch the hyacinth macaws from the blind set up at Wolf Camp at Parnaiba Headwaters National Park. Your guides and hosts, formerly successful hyacinth macaw traffickers, are now their protectors. JAGUAR, THE BIGGEST CAT IN THE WESTERN HEMISPHERE, MAY HAVE NEW HOPE FOR SURVIVAL IN THE CERRADO'S GRASSLANDS THANKS TO A RECENT AGREEMENT BETWEEN FARMERS, RANCHERS AND CONSERVATIONISTS. NEAR EMAS NATIONAL PARK, BRAZIL. IMAGE: ANDRE PESSOA FOR THE JAGUAR CONSERVATION FUND. JAGUAR IS THE ONLY CAT IN THE NEW WORLD THAT CAN ROAR. PHOTO: ANDRE PESSOA FOR JAGUAR CONSERVATION FUND. The jaguar is the world's third largest feline and the biggest cat in the western hemisphere; surpassed only by lions and tigers, but both cats have weaker jaws than the jaguar! It is also the Western Hemisphere's only roaring cat! The others, lion, tigers, and leopards all live across the pond. The jaguar's size, sinuous movements, distinctive rosette markings, and huge gold eyes make a sighting of this cat unforgettable. Unfortunately, neither strength, stealth, nor that mighty roar have kept the jaguars from extermination throughout their diminishing range. Can the Antics of Wild Pigs (Peccaries) Help Save the Jaguar? 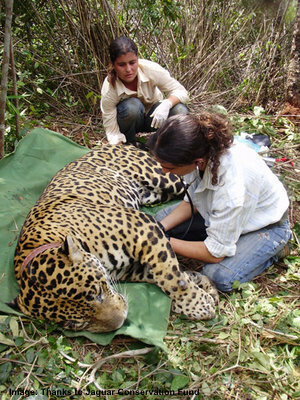 COLLARING A JAGUAR NEAR EMAS NATIONAL PARK IMAGE: JAGUAR CONSERVATION FUND. Ironically, the same farmers who are heavily contributing to both the Cerrado’s and the big cat’s demise may be part of the solution to save the last grassland jaguars of the Cerrado. The great cat’s falling population has allowed peccaries, those ubiquitous South American wild pigs, to propagate at alarming rates. These populous pigs are destroying a larger percentage of farm crops every year. However, a plan put together by The Wildlife Friendly Enterprise Network and conservation organizations in three countries may spell some good news for both the great cats and the farmers. On May 4, 2016, an agreement was announced creating a certification and incentives for maintaining jaguar-friendly forest canopied safe routes from protected areas through farm and ranch land to other protected areas. This is promising news for the embattled wildlife of Emas as soy and cattle farms border the protected area. USUALLY PASSIVE GIANT ANTEATERS WALK ON THEIR KNUCKLES TO PROTECT ITS CLAWS - BUT WATCH OUT! WHEN ALARMED THEY STAND UP-RIGHT BALANCED ON THAT MUSCULAR TAIL, THOSE CLAWS CAN TAKE-OUT A JAGUAR! IMAGE: PAUL BARREIROS COURTESY OF SOUTHWILD WOLF CAMPS. GIANT ANTEATERS LAP UP 35,000 ANTS AND TERMITES PER DAY! IMAGE: THANKS TO ©SOUTHWILD WOLF CAMPS. One of the strangest looking animals in the world must be the giant anteater. They can be "giant" indeed, up to 8 feet from nose to tail, but have tiny eyes and ears sitting way back on impossibly narrow, elongated heads attached to a thick neck and even thicker bodies, culminating with a muscular bushy tail that becomes useful in a fight. If its size and shape are impressive, watching its 24-inch (60 cm) long tongue whip in and out of its mouth as fast as 150 times a minute efficiently lapping up ants and termites (up to 35,000 per day) is even more astonishing! Emas National Park is famous for its sculptural termite mounds. If you are lucky you will catch the giant anteaters using their 4-ince (10 cm) front claws to open a hole just large enough to help themselves but preserve the structure intact for another meal. Like their sloth cousins, giant anteaters usually amble along on all fours at no great speed, using only their front knuckles to protect those claws. However, when provoked, they will stand full height on their back legs, balanced on that massive tail. Do not take a standing giant anteater lightly. They have been known to tear apart a jaguar or puma. Giant anteaters live in all three parks. Is That A Little Shadow Or a Ghost? The Brazilian Three Banded Armadillo was thought to be extinct until the 1990’s when a few were found in isolated populations in eastern Brazil’s Cerrado. 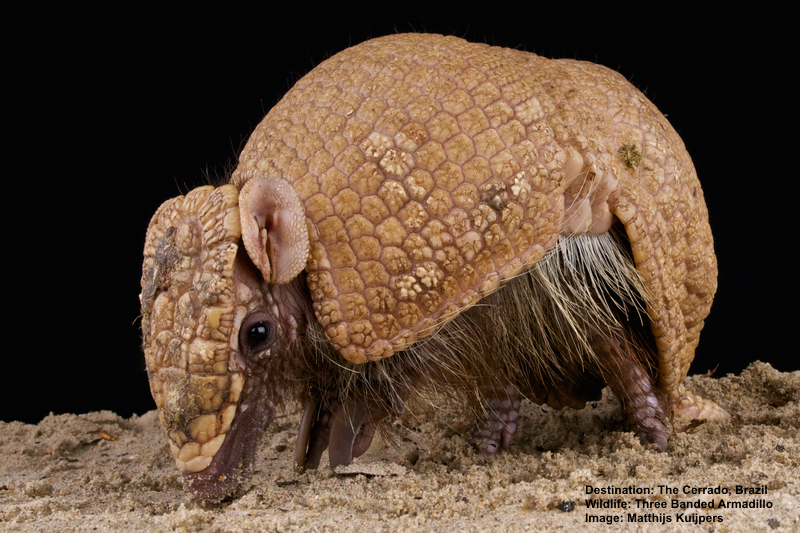 Low to the ground, dressed in armor (bone plates covered in horn), this is the only armadillo species that does not burrow away from danger. Instead it rolls itself into a tight ball, enveloping itself in armor so strong that that only a jaguar or puma can penetrate it. Its balled-up shell fits together like a puzzle, but this species has another trick; it leaves a small space open. When the predator animal sticks its nose or paw inside, the opening is quickly slammed shut causing pain, possible injury, and most certainly discouraging the thought of an armadillo lunch. Couple that ready-for-battle exterior with the ability to run quickly, hold its breath up to six minutes, swim and jump 3 feet straight up when alarmed, and you might think they are invincible. That would be the wrong assumption. Even the recently discovered populations are disappearing. Best place to see them: Parnaiba Headwaters National Park is one of the last known places to find the three banded Brazilian armadillo. 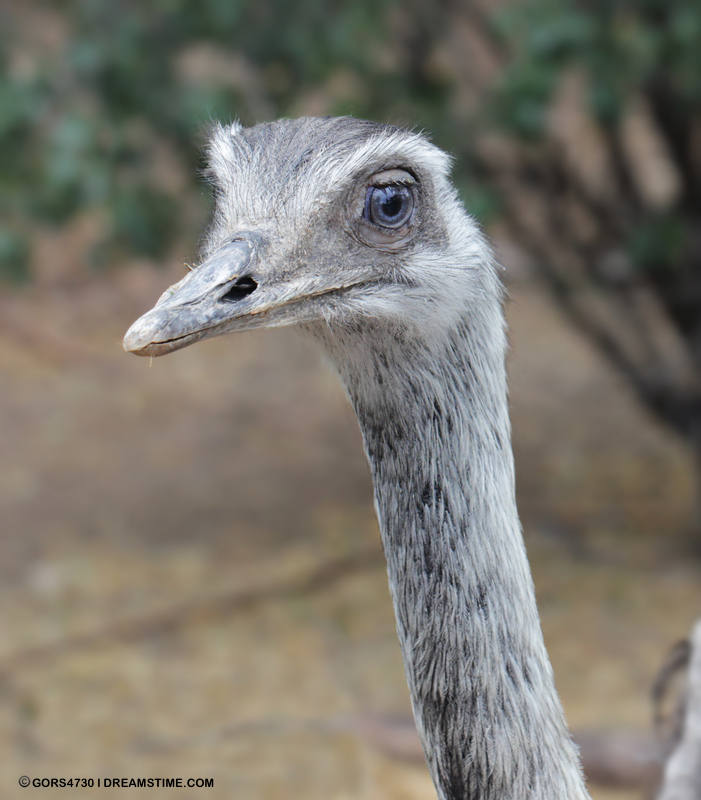 The greater rhea, South America’s largest bird, is also its most accomplished avian Casanova. However, this enormous flightless bird does not just love and leave the two to twelve mates he gathers every spring; he takes responsibility first for building the ground nest and then sitting on the dozen to 50 or so eggs until they all hatch. Lucky for him they do that synchronously. That is good for viewing because you will be able to watch a whole flock interact. Speaking of flocks – or herds, these birds like to socialize with certain other animals, such as deer or guanacos, forming mixed groups of birds and beasts. The more eyes watching out for predators the better! 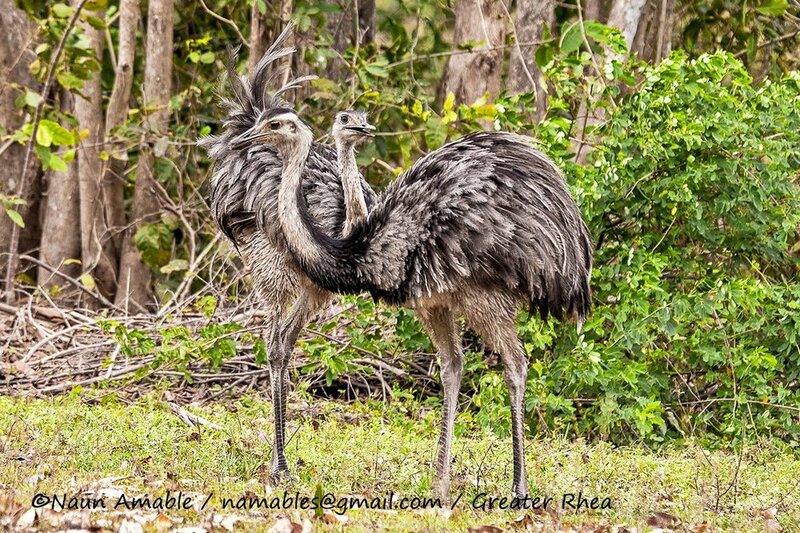 Giant Rheas live in all three parks but “Emas” literally means Rhea, and Emas National Park is a great place to see them – look for pampas deer, too (pampas deer are IUCN Red List: Near Threatened). Enjoy! While you are in the Cerrado, take a look around also for giant tapir, ocelots, jaguarundi, margay, tufted-eared marmoset, and black howler monkey. The best places to see most of the wildlife mentioned in this article is Parnaiba Headwaters National Park or Emas National Park. Both are very remote, but very worth the effort. The SouthWild Wolf Camps is the only option, but a very good one, in Parnaiba Headwaters NP. For more information contact Arcana Mundi Expeditions. 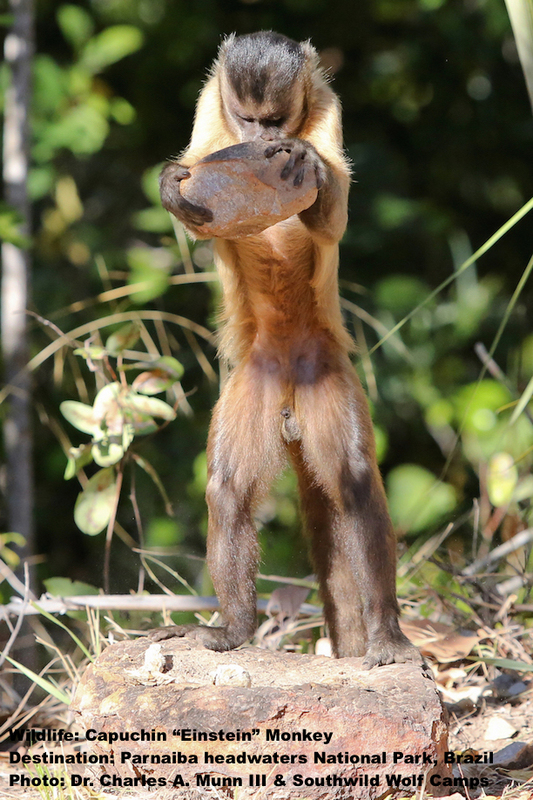 the cerrado is home to a number of monkey species. 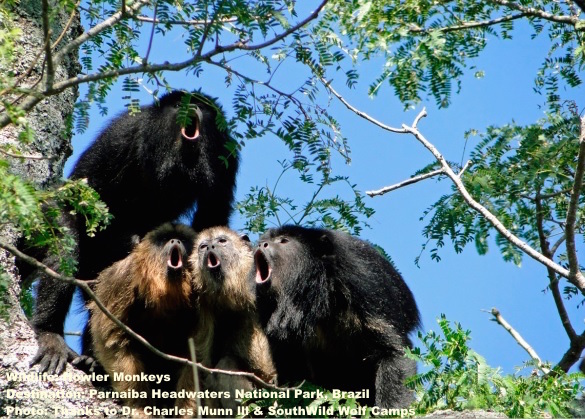 this chorus of howler monkeys is in parnaiba headwaters national park. image: thanks to dr. charles a. munn iii and southwild wolf camps. Dr. Charles A. Munn III For his help, enthusiasm and the use of his wonderful images.